It’s come round again, and so quickly too. Wasn’t it just summer? Didn’t my kids just have their birthdays? Where has the time gone, and why does it seem to fly by faster each year? Christmas Eve – Since the 1st my kids have been asking when Christmas morning would come. When could they open stockings and gifts? When could we go to the mall to see the decorations? When would school be out and holidays begin? Now it is the 24th and I am still wondering what happened with all that time I thought I had. 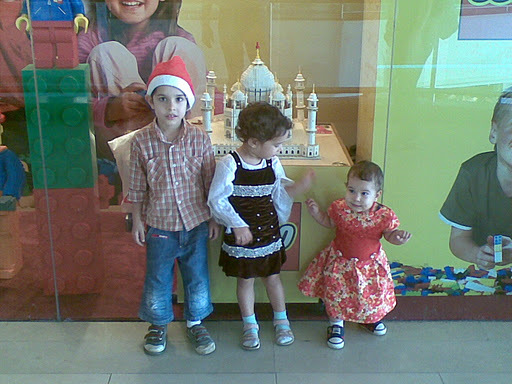 Today we took them to the same large mall we went to last year. There was only a central display, nothing they could actually do, like the train we rode last year. It was a two-story teddy bear house, complete with dancing bears, a teddy ferris wheel, bears drinking at tables, standing on balconies, and one army bear standing guard at the entrance to make sure no one went in. These bears were about 3 feet tall and dressed in party clothes (except for the army bear, of course – he wore the Indian army uniform). Then we went over to Hamleys just for fun. They love this toy shop, since there is lots to see and even play with. Their usual strictness about not playing with all the toys seemed to be relaxed and the kids had fun touching all the displays. Logan found a mat drum kit and had a ball with that, while Lila drove a scooter around and Scarlett tried out each rocking toy. If it could be played with, they did it. After ice cream and a short walk around the mall, we were leaving when I noticed Santa was in the toy shop, so they went over for a treat and Hamleys badge before we headed home. We spent the afternoon at home, playing, eating, napping, and lots of t.v. In fact, because of their naps, the girls weren’t ready to sleep until late. It was 11 p.m. before I got them into bed. Then I decided to do some prep for tomorrow morning. 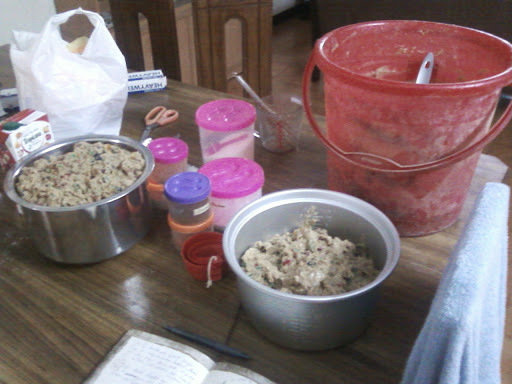 So the strawberries are washed and ready, the biscuit dough is made, fruitcake is cut and cookies are ready to be put out. The children are all now sleeping soundly, as is daddy, who fell asleep on the couch with the t.v. on and Scarlett in his arms. Which brings me to why I felt the need to write a post after midnight. As I filled stockings and laid the gifts around the tree, I felt just a twinge of sadness. 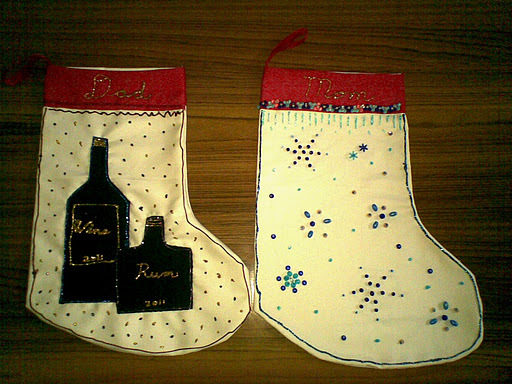 My own stocking will remain empty and there won’t be any gift for me under the tree. As a child I always looked forward to opening gifts and seeing what unusual surprise there would be in my stocking (like the year when I was around 13, it was full of stickers that needed to be colored). Now that I am the one doing the buying, wrapping, and filling, it seems weird to put out gifts I bought myself. Actually, I have yet to get myself a gift this year. I did buy two tops but I needed them right away for the cooler weather so I’ve been using them already. Sometimes it’s hard being married to a man who hates shopping so much that he refuses to go get me a gift, even if I give him ideas about what he could choose. I can’t remember the last time I had a surprise gift for either Christmas or my birthday. I guess most mothers face this, at least until their kids are grown enough to go shopping on their own. I plan on training mine to each get me something so that, come Christmas morning, I will have at least 3 gifts instead of none. It will always be a dream to get a gift from my husband, but maybe one day it will come true. So tell me, ladies. Does your husband/boyfriend buy you gifts or expect you to get your own? Men, do you buy something for your wife/girlfriend even if you hate shopping? Wow, Christmas Day is almost upon us and I have yet to write anything about how we have been enjoying the Christmas season so far. I like to decorate from the beginning of December, so around the first I pulled out our new tree. For the past 2 years we had a tiny tabletop tree, but I was ok with it as it was easy to keep the kids away from it and I didn’t have to worry about it being pulled down. This year someone gave us a bigger tree, about twice the size of the old one, that rotates and has fiber optic lights on the ends of each branch. I set it up one morning while Logan and Lila were at school. Setting up the tree is my job and the only way to get it done undisturbed is when they are out or sleeping. First I had to figure out where to put it, since there is only one electrical outlet in the living room and the t.v. was planted squarely in front of it. Then I had to rearrange some furniture since I planned to put this cute electric train around the bottom, if I could find a spike buster that could handle different types of plugs together so that the tree, train, t.v. and set-top box could all be connected to the same outlet. This train was given to us 2 years ago but I never used it because we only had the small tree and I also didn’t have a proper spike buster for it. It is not Indian-made so the plug doesn’t fit into the outlets here. I knew the kids would love it though, so once I was sure I could plug it in, I set it up around the kids’ plastic table. Then I added a white bed spread to resemble snowy mountains and put the tree on top of it. When they got in from school that morning their faces just lit up; they were so happy. They have named it the Polar Express, after the movie, of course. Lila especially was so happy to see it, as when I asked her what she wanted for Christmas, she requested a train. She saw some in some of the Christmas cartoons they have been watching and it was all she wanted. So she thinks it is hers. Ha. At least I don’t have to buy an expensive train set that they would break in a week. They aren’t really ready to care for a toy like that, so I’m happy this fulfilled her request. 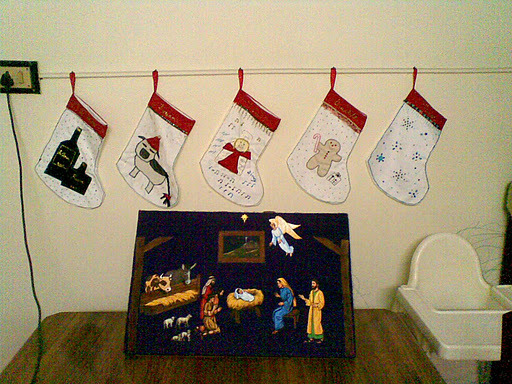 I hung out our stockings in the same place as last year. To keep them clean all year I wrapped each one separately in a plastic bag, and they looked great when I pulled them out. Something new I did was make a wreath for the front door out of old cards. I simply cut a cardstock ring, arranged the cards around it, then taped them in place. In the middle is a paper wreath Logan made at school last year that I had saved in the decoration box. The card on the bottom lights up when you push the button, so Logan spends lots of time pushing it. The kids have been enjoying some of their favorite Christmas movies again this year, eating my fruitcake, and going for outings to our local malls to see the decorations. Since only a small percentage of the population in India actually celebrate Christmas, the challenge is to find places that look Christmasy. Malls and 5 star hotels are the best places to go. Next week we will again go to the large modern mall that had a huge Christmas display. I’ve seen what they are setting up for this year and I think the kids will love it. This year I had a near-disaster with my Christmas fruitcakes: I ended up with too much batter due to a mental lapse and miscalculation. The story itself is quite funny. 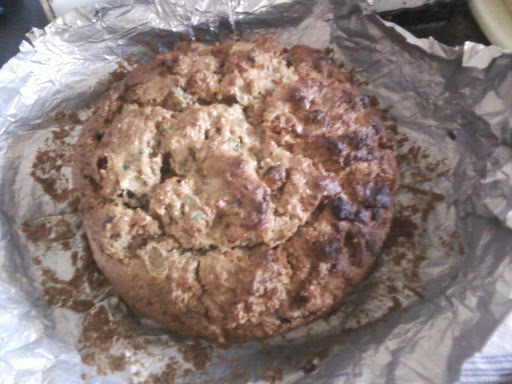 I had finally put together my perfect fruitcake recipe. I tested it and everyone liked it so I prepared to make a larger batch to cover all my cakes at once. I only have a small oven, so of course, the pans are small (7″). My recipe makes enough for two of these pans or one larger pan – but that is what I forgot about when I began to calculate the ingredients I would need for 6 cakes – the amount I meant to make. So instead of multiplying the recipe by 3, I did it by 6, meaning I would get 12 cakes out of it with the size pans I was using. Even when buying the ingredients, it didn’t register that 3 kgs. each of fruit and flour and 24 eggs was more than I meant to use. I dug out my biggest pots to mix it all in. One was already full of the fruit I had presoaked in rum, and by the time I had mixed in enough flour to coat it all, the pot was overflowing. 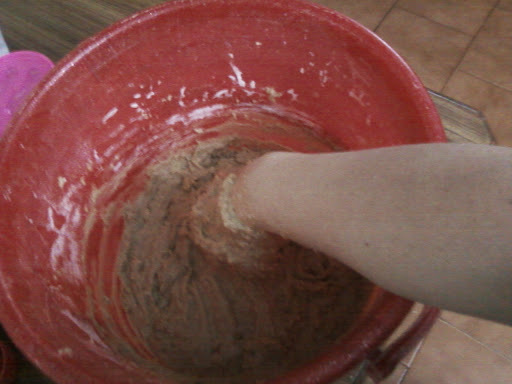 I mixed the dry ingredents in another pot and the wet ones in a third pot. As you can see, each of the pots were full up and it wasn’t going to be possible to mix everything together in one pot. I think it was around there that I realised my mistake, but there was no going back now that I had begun. I began to think hard about how I could put it all together. The only item in the house large enough to mix everything in was the shower bucket. Before you freak out and think “gross”, I scrubbed it with Lysol and then washed it with dishsoap, so it was very clean (on the inside) when I used it. And yes, I had to mix it with my hand as it was a thick batter, just the way a fruitcake batter should be, but in the largest quantity I had ever seen. I hadn’t planned on mass producing cakes. 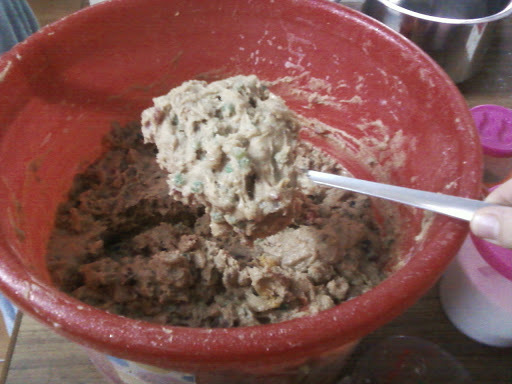 As I stood there elbow-deep in fruitcake batter, all I could do was laugh and make sure I got pictures of the whole thing. Once it was mixed, I was able to transfer it into the pots again and get the bucket back to its rightful place in the bathroom. It took me two days to bake all 12 cakes and I’ve ended up with more than I planned on, but maybe I will end up needing them. At least half will be given away to friends and taken to school by the kids but the rest are for us. Maybe I should save some of them for next year. I’ve spent years trying to find the perfect fruitcake recipe. I’m particular about fruitcake. I like it moist, with lots of fruit but no nuts, and no odd ingredients that are hard to find. So after reading and researching hundreds of recipes, the solution was to put my own together. Here you will find my personal fruitcake recipe – tried, tested and delicious. I followed the fruitcake tips found at this link and they came out better than any recipe I have tried before. 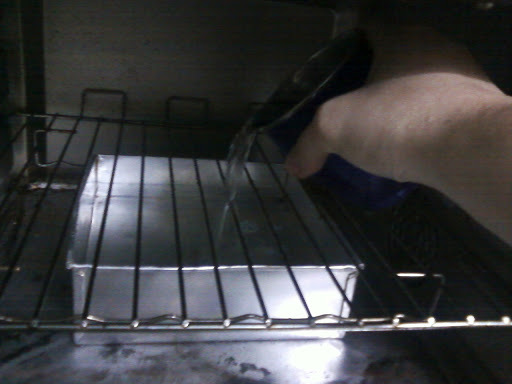 I only have a small oven so I worked with 7″ x 2 1/4″ square and 7″ x 2″ round pans. This recipe is enough for two pans that size or you could use a larger one. Check this site for approximate pan size conversions. 1) Begin by presoaking your chosen fruits. Place in a bowl or pot that has some expanding space, since the fruit will swell as it soaks up the rum. Add enough rum to cover the fruit, then cover with a lid and allow to sit. The site I mentioned above suggests soaking them a minimum of 3 days. I did them for a week. 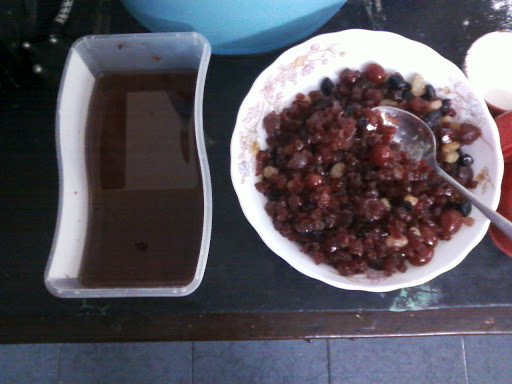 2) When you are ready to bake your cake, drain the liquid off the fruit and set aside to use in the recipe. It will be syrupy. 4) Line your pan with wax paper or foil. To help it stick, lightly grease the pan with a little cooking oil. Then put the paper in, pressing into the corners and sides so it can fill properly. With the foil, you will have to press it down slowly so that it doesn’t rip. Set aside. 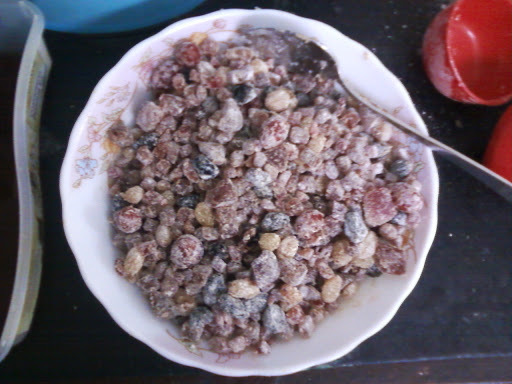 3) Toss the fruits with 3/4 cup of the flour in order to cover them well. This will keep them from sinking to the bottom of the cake. Set aside. 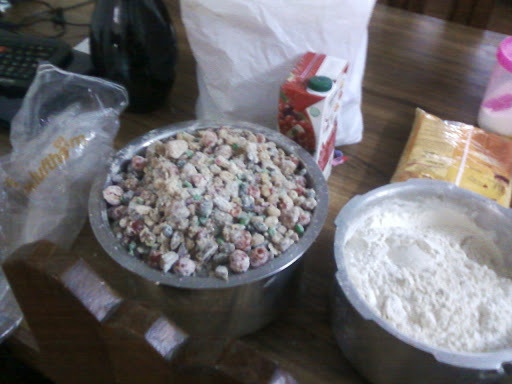 4) Mix the remaining flour and all the rest of the dry ingredients together in one bowl. 5) In another large bowl, mix together the butter and sugar, then the eggs. Measure the liquid that you drained off the fruit and add to it as much juice or rum as you need to make a cup. 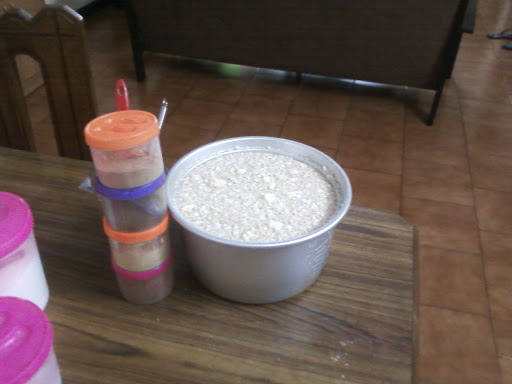 6) Mix the dry ingredients into the wet, a small amount at a time ’till it is all mixed. 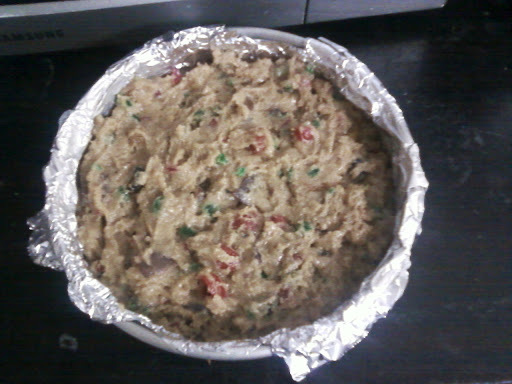 7) Add the fruit to the batter until just mixed. Spoon into the prepared pan, making sure to not fill it more than 3/4 of the way. If it is overfilled, it will rise too much, take longer to cook, and not look as nice. 8) Cover the pan with some foil to keep it from overbrowning. What I did, since I have such a tiny oven, was I covered the cake for the first hour, then I took it off for the last 15 minutes and the color on top was perfect. The top pan is the cake, the bottom one the water. 9) Test for doneness by inserting a toothpick or knife into the center. It should be moist but not raw. Place on wire rack to cool. Once cool, remove the foil. 10 ) Fruitcakes taste best when they are aged. 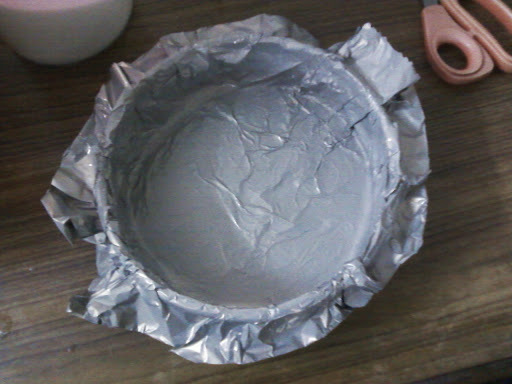 To age, tear a large piece of foil, then place a cloth on it. You are going to wrap the cake with it so make sure it is clean and one that you don’t mind getting this kind of use. Cheesecloth is best but you can also use tea towels or cotton diapers (clean ones, of course). Set the cake in the middle and pour rum all over it. 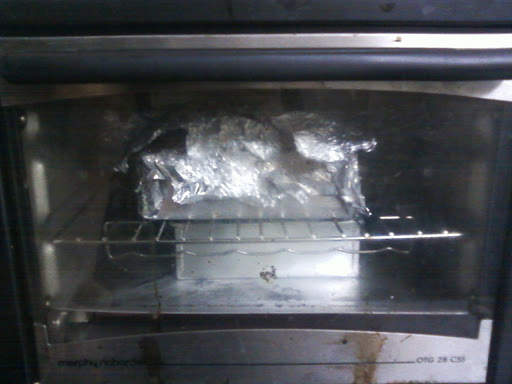 The cloth should soak some up, then wrap it well, first with the cloth, then the foil. Store in a cool, dry place. You can eat these cakes straight out of the oven, but they taste better with some aging. If you haven’t done so yet, go and read this list of tips so that your fruitcakes can come out perfect too. Note: If you try this recipe and you like it, feel free to share it but be sure to link back to this post. Tks. This post has been shared with the linky party over at Spatulas on Parade and Merry, Merry Munchies at Dining with Debbie. Check them out. Yet another Christmas has come and gone, our 4th as a family. 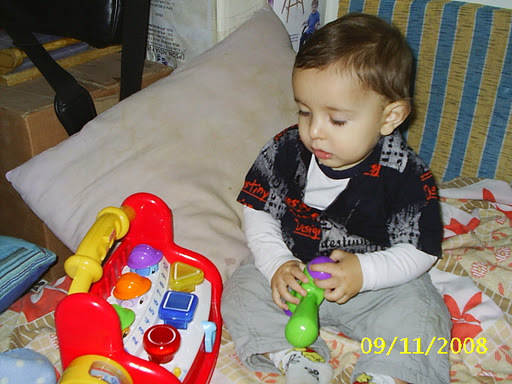 This year was the most exciting so far in terms of the children enjoying it, just because they are older now. Logan understood better when I asked him what he wanted for Christmas. His reply? A pig for his farm set. He had gotten some animals on his birthday but there was no pig in the set. I had actually never seen a set with a pig, but the first day I went shopping, I found a set by a different company and it had a pig. Perfect. Logan also got some puzzles (another request), a Lego set, a frizbee, a Winnie the Pooh reader/workbook, and a toy keyboard. He loves music so I’m hoping he will learn how to play it. Lila didn’t know what to ask for so I got her a tea set, baby doll, puzzle, Winnie the Pooh workbooks for colors and shapes, and a frizbee. Scarlett got a baby doll and Fisher Price xylophone. 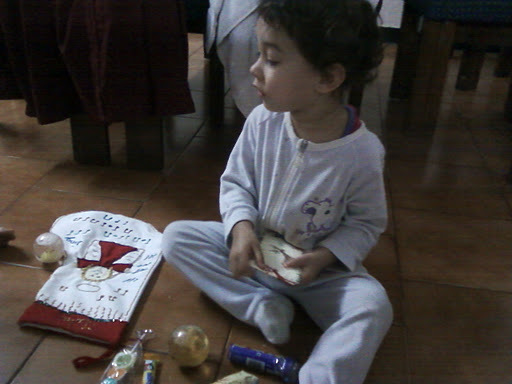 In their stockings they each got two wrapped toys, a ball with water and glitter in it, and some chocolate treats. 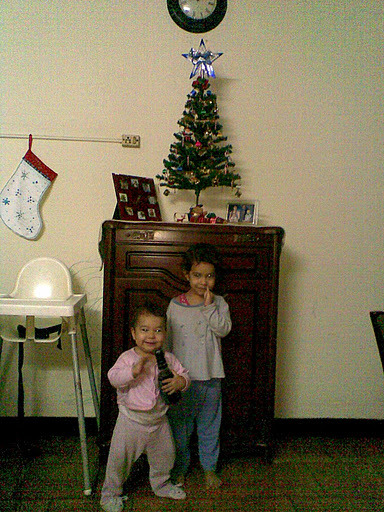 They were very happy and spent all of Christmas day playing with their new things. Glad had to work until the 23rd so we set aside the 24th as a day to go out together and celebrate. We went out to a mall, the largest here and the only one that is built like a western mall. I should do a post on Indian malls some day. I’m sure you’d love that. Anyway, we headed out in an auto, all 5 of us just fit. The first thing we did was to take a ride on the train that was circling the central display of a huge tree and a winter scene complete with painted snow, little houses, Santa and a manger scene. The kids were excited until we got on; then Lila wanted to get off right away. It’s funny because it was a slow train and it just did two rounds and she cried, yet Lila likes to go in autos which are much faster. Our view from the train. After the train we went to the large toy store that they have. Too bad they don’t allow photo taking cause they have some great toys. We spent a long time there, letting the kids look at whatever they wanted. Logan found a tiny stage and got up there to dance to the piped in music. Taken outside the toy store. That is a Lego Taj Mahal behind them. After the toy store we did some shopping – shoes for Lila, socks for Scarlett, a belt for Logan and earrings for me. Nothing grand but all needed. Besides, their gifts were already bought. After that we had lunch and then headed home where Logan and Lila napped (Scarlett had napped at the mall) and Glad went out to get my gift from my mom – a new phone. Mom actually managed to convince him to get me something from her. Amazing, considering he hates gift shopping. Now I can take photos and videos when I want without waiting for his phone to be home. I’m happy for that. Maybe next year he will get me something from him. Fingers crossed. In the evening we watched a Christmas movie together over pizza, a very rare treat. 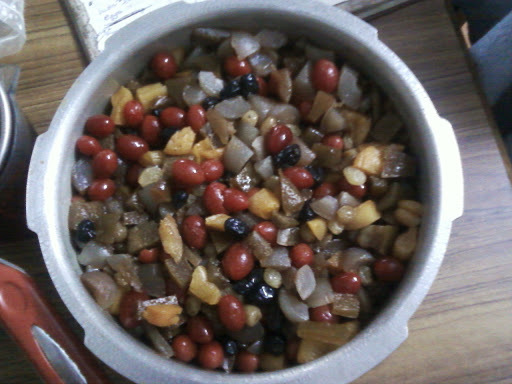 We also dug into the one fruitcake I had managed to soak and age properly; it was moist and very alcoholic. Yummy! The brandy was super strong but it was good. I had to hold Logan back as he likes fruitcake so much he wanted to eat the whole thing himself and hardly left any for the rest of us. Sorry I never got any Christmas cards sent. We haven’t gotten our yearly family photo yet, and unless I can convince Glad to leave the cricket on t.v. long enough to go out, it won’t happen. Now Logan keeps asking for more gifts and to open his stocking again, and when I told him he’d have to wait until next year, he decided to start on his list for next Christmas – he wants a cat, a toy one. I’ll see what I can do about that. 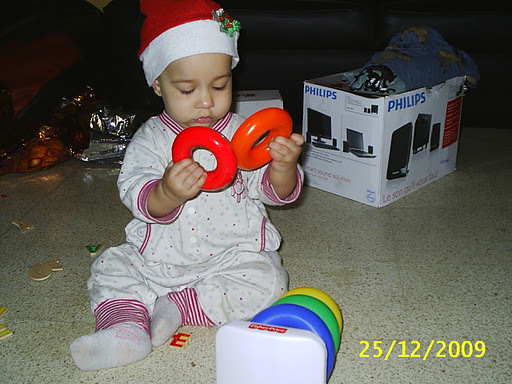 To see more Christmas photos, click here. There hasn’t been anything exciting happening around here lately. I think the most exciting thing this week was finding a string of lights for our tree. 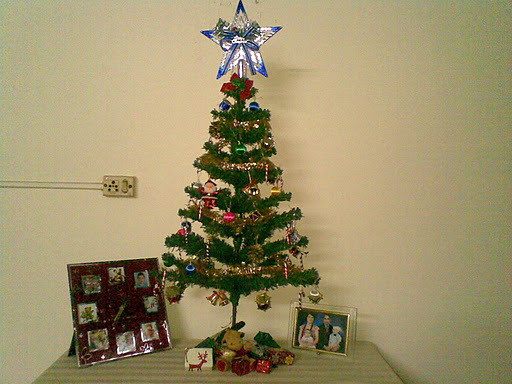 I so miss being surrounded by Christmas. 😦 This morning I woke to heavy rain; unusual, since the monsoon has been over for a while and we have had some heat lately. I hope it warms up again cause we have plans to join some friends at a beach resort on Sunday for swimming. Logan asks about it daily and would be so disappointed if we can’t go. Tree setup this year, before I found the lights. 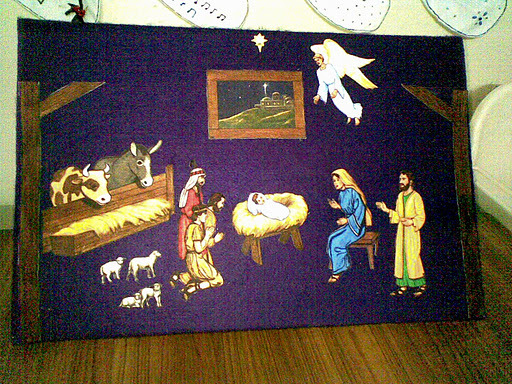 Flannelgraph manger scene. I figured this is safer for the kids than a ceramic one. Besides, I don’t have another one. 🙂 Set is from Betty Lukens. 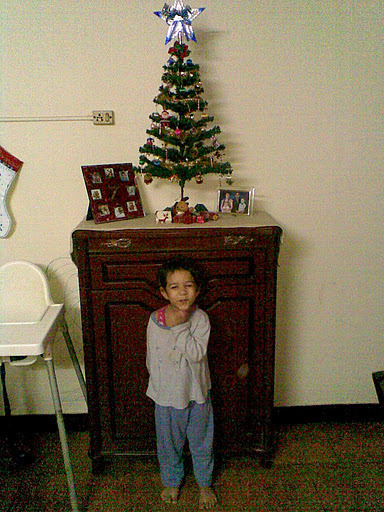 And this is why I stuck with the small tree this year – no worries about it being toppled. Well, unless Lila climbs up on the stool and isn’t careful. So far she has been; Scarlett would have eaten the whole thing by now. I don’t have anything more to write right now so I will leave a few links from past Christmas posts for you to check out. Do you like Christmas movies? I love them. They take me back to when I was a child and Christmas just had that magical feel to it, unlike now. I try so hard to feel the magic but it seems to be lost to me, probably because I have spent the last 8 Christmases in a country where it is only celebrated by a minority of people, so it is not in the air in the same way as it is in a country where Christmas is a major holiday. I am trying to bring that magic to my kids. I want them to be excited about Christmas and look forward to the whole season, not just the gifts. We have our little tree up and have hung our stockings; each day we cut a number off our countdown chart and have a treat, and I frequently hear them singing carols. These come from the Christmas movies and cartoons they have been watching lately, though they did start watching some as far back as October. 🙂 When Lila goes around singing her version of “Jingle Bells” or Logan goes on with “We Wish You a Merry Christmas” for a half hour straight, or like today, they both sang (and I had no idea they had memorised the words) “The 12 Days of Christmas”, I know that they are indeed feeling the Christmas spirit. So to pass on some of this Christmas spirit, I decided to share with you some of the Christmas movies and cartoons we have seen lately, just in case you need some ideas. This is their top favorite, must-see almost daily cartoon. They love it and have the whole thing memorised. A great one for all children. The sequel the the above cartoon, except done in computer animation. Their second daily choice. Disney version of the Dickens classic “A Christmas Carol”. Another current favorite. If they aren’t watching “Once Upon A Christmas” then they are watching this. I believe this is an animated version of the book. Cute short about a snowman who comes to life. Another favorite of theirs. Cute story about a dog who saves his owners’ home from robbers, kind of along the lines of Home Alone, but with a dog instead. My kids enjoyed most of it since it has lots of animal scenes, but there is a fair amount of dialogue that will go over little kids’ heads. Another dog rescuer movie. Not as great as the other Beethoven movies, but enjoyable. My kids found it to be rather long and too much dialogue for them, but older children would probably like it. Just saw this one with Logan the other night and I think I liked it more than he did, though I think he lasted well through it, seeing as the story is aimed at older children, probably 8 – 12 yrs. It is about friendship and magical reindeer, ice skating, and thinking of others more than yourself. Santa is played by Christopher Plummer and the reindeer’s voice is done by Whoopie Goldberg. I thought it was well done and a great Christmas movie. Update 2012: One of their new favorites is Ice Age: A Mammoth Christmas 2011 (26 min.). They saw it on t.v. last Christmas and then I downloaded a copy. They watch it often with daddy. Full of fun and laughs. And don’t forget some of the classics like “White Christmas” (1954, 120 min.). That is a great family Christmas movie, though you do have to like those old style movies to really enjoy it. This is one I watch every year without fail. Don’t know if my kids will last through it this year, but I’m gonna try. What is your favorite Christmas movie? Let’s make this list grow. 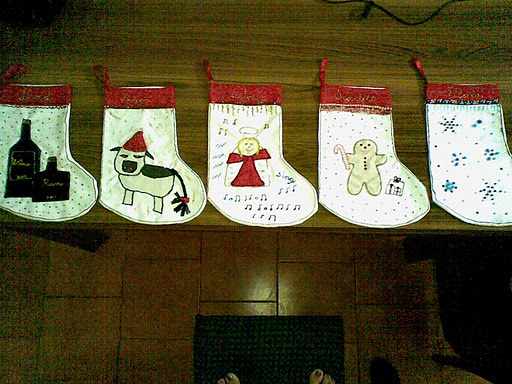 So I finally got them done – our Christmas stockings. I wanted them done before the first of December and they were, though I had to push hard on the last two. I just worked on them when I could find the time. It would have gone faster if I had of had a sewing machine, but you know, I feel good cause I did something creative with my hands that I hadn’t done in years. I used to make things when I was young and had time on my hands, but now it is hard find the time to do anything extra. Each one is unique and has a theme that, for at least Glad, Logan and myself, is meaningful to us. From left to right we have: Dad – wine and rum bottles, Logan – a cow, Lila – an angel, Scarlett – a gingerbread man, and Mom (me) – snowflakes. All 5 of them – ignore my toes on the bottom. I had to hold the phone over my head to get the shot just to fit them all in. Making them was quite simple, that is, if you know how to sew it is simple. First I cut the stocking pattern on the fold to save on stitching. Then I cut and added the red trim. On the trim I added sequins or beads to finish it. 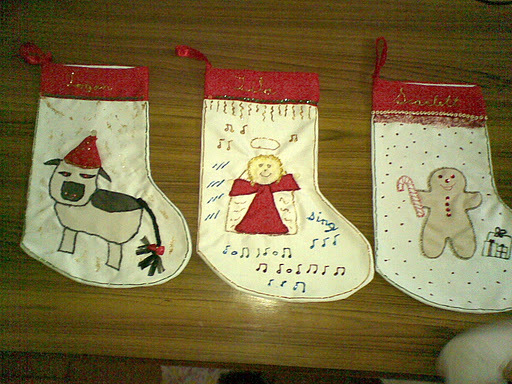 For the pictures, I made paper patterns, cut them out double, then over-stitched them and just tacked them on to the stocking. I finished each one with fabric glitter glue. Some of the materials were easier to work with than others, but the best part of this project was that I had everything I used for it in the house. All I bought was one bottle of gold fabric glue, since it was the only one I didn’t have. The children’s – see their names on the tops? Click here to see individual pics of each one. Now that that is out of the way, I can begin decorating. I dug the tree out today and it is standing on top of a cabinet waiting for me to get some lights for it. Last year we only decorated the tree; nothing got done for the house. This year I want to do more for the house, and some friends of ours want to come help decorate, meaning I need to go shopping for decorations. Fun, fun, but not if I have to take the girls with me, which I will most likely have to do. The best place to get decorations close by is a tiny shop that is crammed full of stuff and has tiny, narrow ailes. It is like shopping inside a box. Anyway, if I have to take them it will be a quick trip because tiny hands in a shop with attractive stuff is equal to one bottle of vodka, if you catch my drift. The season is now upon us: Christmas!!! I love Christmas, even more now that I have children to share it with. I have been excitedly buying and stashing gifts for them, some requested and some surprises. But as a first-time mommy it is understandable that you might be stumped as to what to get them. You see so many great things, but what is best? 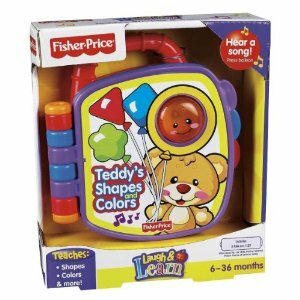 My top recommendation is Fisher-Price toys. Why? 1. Quality – they are sturdy and solid. 2. 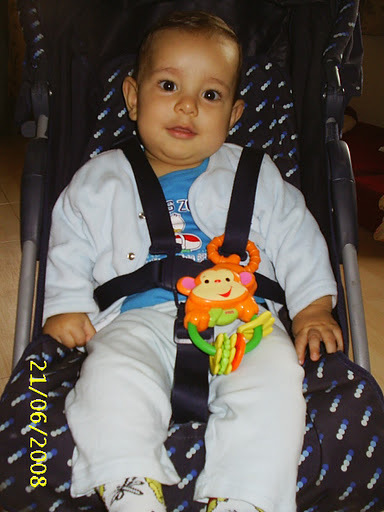 Colorful – they attract children and are fun to use. I find them attractive for me too. 3. Educational – the majority of them teach some skill or educate the child in some way. 4. Most importantly – they don’t break. Toys that break after a few uses are a waste of money. Invest in quality items and they will last a long time. 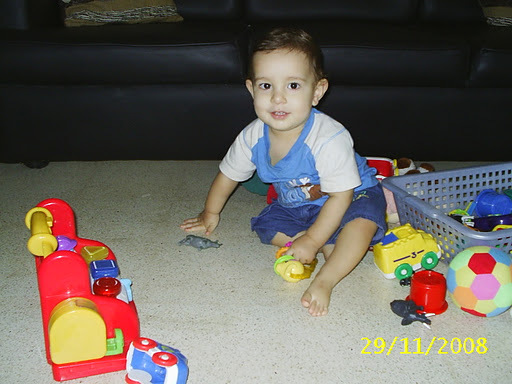 Here are some of the Fisher-Price toys my children have or had. This was Logan’s first Christmas gift and his first toy. It is still attached to my stroller even now and Scarlett is using it. 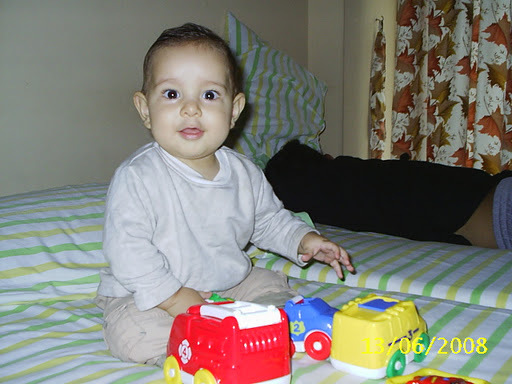 I bought him these trucks when he was three months old and we still have them, except for the smallest one. It got lost. Another gift. See it in his hand? 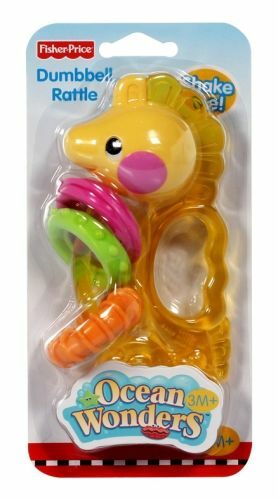 Lila was 8 months old on her first Christmas so I got her something she could work with, as opposed to a rattle. She figured it out quickly. 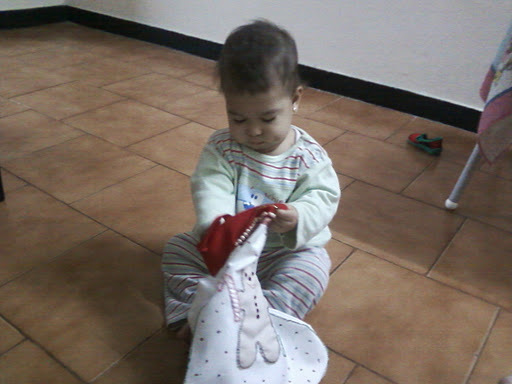 For her first birthday, Lila got these two toys. Too bad the book got lost; they enjoyed it a lot. 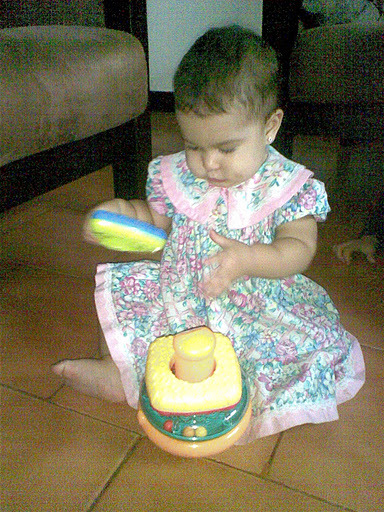 We still have the shape sorter and Scarlett uses it now. 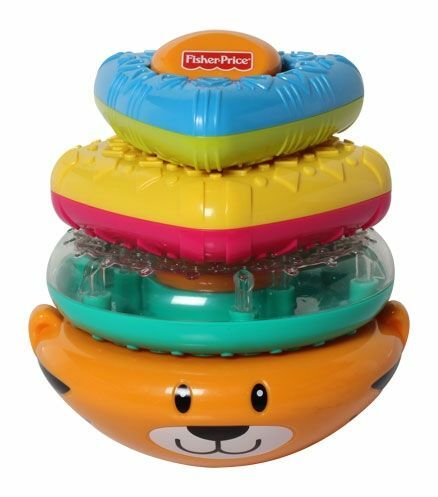 Scarlett just had her first birthday and I got her this Tiger Stacker. She really enjoys it. 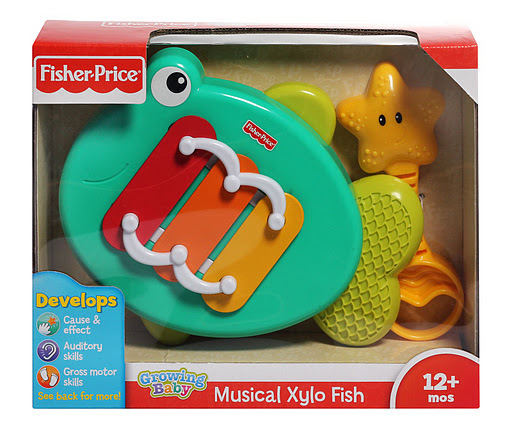 And for Christmas, she is getting this toy, the Growing Baby Musical Xylo Fish. I can’t wait to see how much she enjoys it. 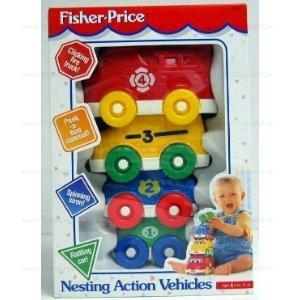 While I consider Fisher-Price a top brand for small children’s toys, it is by no means the only good brand out there. Some other good ones that I am familiar with are Duplo and Playskool. I also love good wooden toys, though I don’t have a specific brand in mind for that. I hope this is a help to you. Happy shopping! Disclaimer: I’ve written this as an idea-giver. 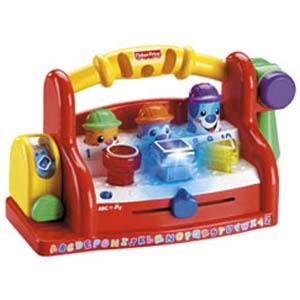 It is not a review for Fisher-Price toys. I was not asked to do this and all thoughts and ideas are my own. 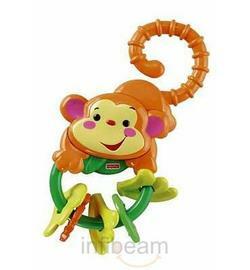 What is your favorite toy brand and what do you think you will be getting your child this Christmas?